I have uploaded many of my photographs to FamilySearch. I am about half way through all my photos that are family history related. It is more time-consuming than I thought it would be. This photo was provided to me by a distant cousin. Knowing I am distantly related to their Jonas relatives, I appreciate having a copy. Unfortunately I know little beyond the basic life facts of these people. Mary Jonas is my third cousin three times removed. She was born 8 June 1869 in Richfield, Washington, Wisconsin and died 14 November 1951 in Neenah, Winnebago, Wisconsin. She was buried 17 November 1951 in Oshkosh, Winnebago, Wisconsin. 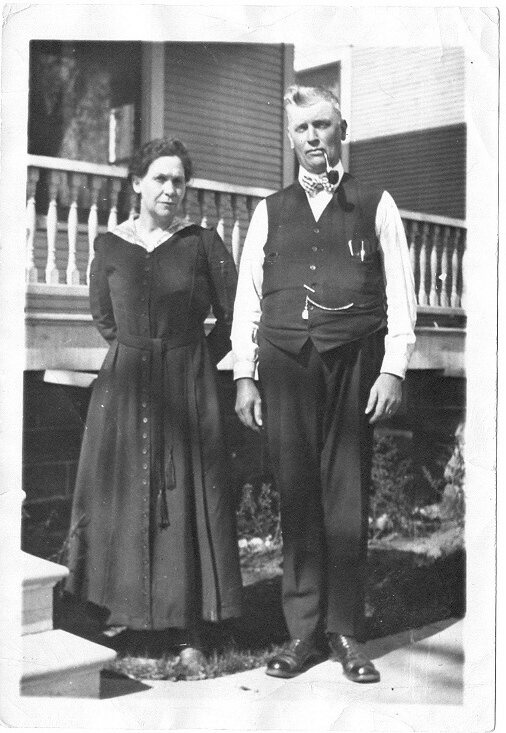 Her parents are John Jonas (1845-1928) and Margaret Mary Voss (1849-1929). Mary married Bernard Bruno Schneider on 2 May 1893 in Milwaukee, Milwaukee, Wisconsin. He was born 11 December 1872 in Berlin, Germany and died 22 June 1927 in Oshkosh. Together Bernard and Mary had 8 children. Margaret Schneider born 26 May 1894 in Milwaukee and died 31 July 1986. Bernard John Schneider born 6 June 1896 in Oshkosh and died 19 December 1986 in Neenah. Appolonia A Schneider born 12 May 1898 in Oshkosh and died 12 December 1980 in Oshkosh. Eleanor Schneider born 6 May 1901 in Oshkosh and died 5 February 1983 in Neenah. Maria Schneider born 20 January 1903 in Oshkosh and died 29 November 1991 in Manitowoc, Manitowoc, Wisconsin. Francis Schneider born 1905 in Oshkosh and died 1908 in Oshkosh. Catherine Schneider born 29 January 1909 in Oshkosh and died 28 December 2002. Ralph John Schneider born 18 August 1910 in Oshkosh and died 1 June 1977 in Oshkosh.